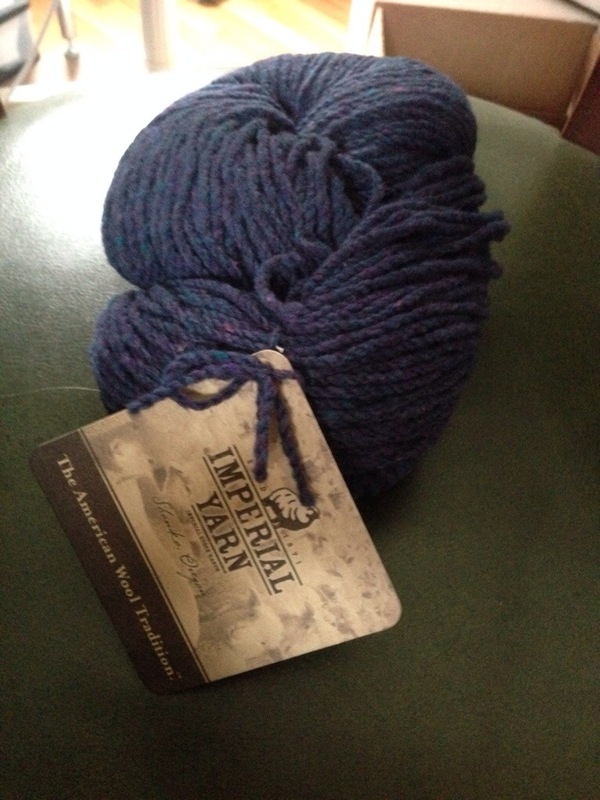 Imperial Yarn, I am taking this opportunity to publicly applaud you for two things you are doing right. The tags are securely attached, but with a firm bow, not a knot. That means I don’t have to trim with a scissors. That’s a little bit more yarn that doesn’t go to waste. I don’t always have the patience, or even the ability to untie the knots that yarn companies use to bind their hanks together. I greatly appreciate it when companies make thoughtful choices with their packaging. Some sort of label or tag is necessary when selling commercial yarn. Ball bands are secure and provide lots of surface area for printing text and images, but they’re fragile and easy to lose. And they really have no utility once they’ve been removed. Tags are often not much better, in my opinion, as they are too stiff to roll up and stuff into the center of a yarn cake and too small to be re-purposed as anything else. Plus, a lot of yarn companies (hello Quince and Co.) attach them to their hanks with such long loops of yarn attached that they seem to be promoting this tangling problem. Imperial Yarn uses nice large tags, bound closely to their hanks, so they don’t tangle. 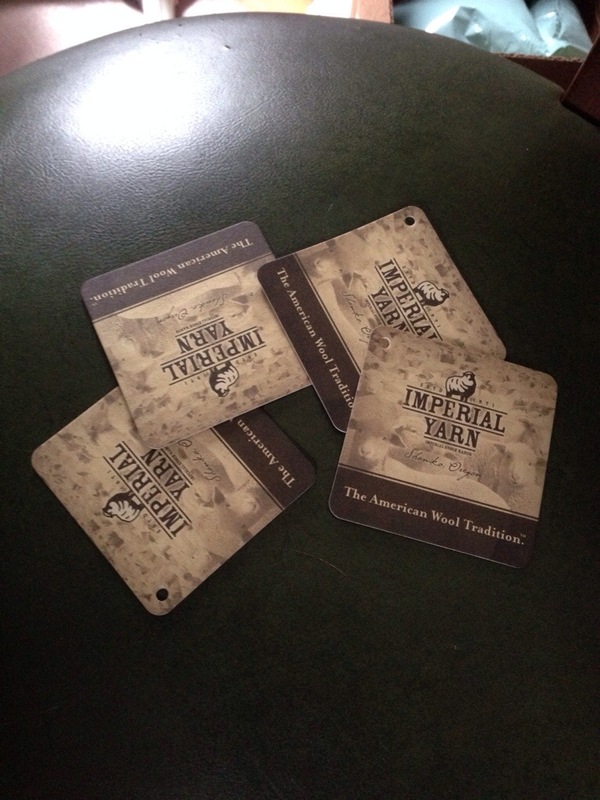 And those tags are exactly the right size and thickness to serve as coasters. I don’t know about you, but I think a home can never have too many coasters. My knitting is usually accompanied by a drink of some kind: hot tea or wine in in the winter, a cold beer or iced tea in the summer. As an added bonus, knitters like me are littering their homes with free advertising for Imperial Yarns. A complete win-win, in my opinion. Hats off to you, Imperial Yarn. thanks for an amusing and thoughtful blog post. companies that do it right deserve all the praise they can get for it! Thanks. I totally agree, of course. Who are you a fan of? I hadn’t heard of this yarn, but I am all about not having to waste any yarn untying the hank. Go Imperial! I like the look of that tweedy goodness! and a little thoughtfulness goes a long way in my opinion. They’re located in the state of Oregon. Maybe they don’t distribute over the pond. Clever post! Knots are one of my pet peeves too! Tommy Bahama has great “coaster” tags too. LOL! Is that a yarn brand? Q – No, a clothes brand. 😎 It just struck me as funny that we’ve both found labels we love a coasters. Ha. I see. Yeah that is pretty funny. Nice to keep on hand for when you have more company than regular coasters.